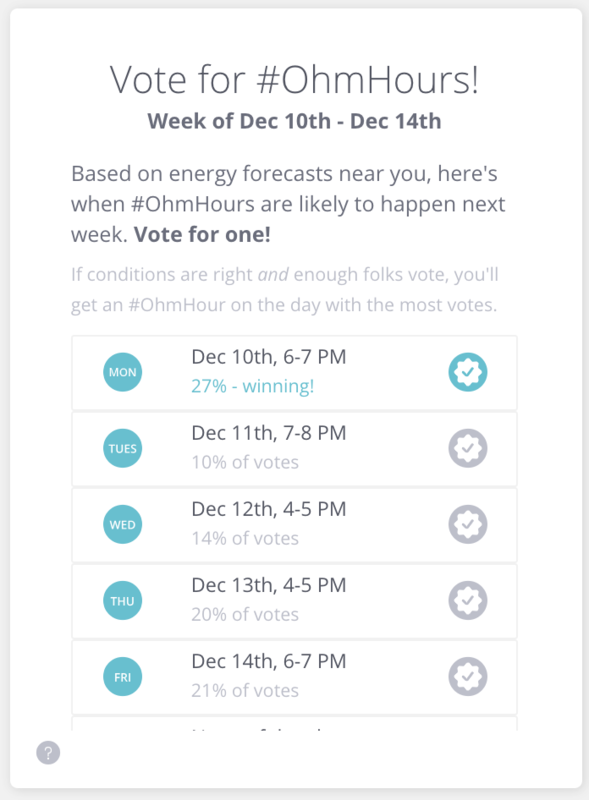 Over the next month, we'll be rolling out a new feature: voting for #OhmHours. Heads up! Not everyone will see this feature immediately, so if you're eager to get early access, drop us a note and we'll add you to the list of Beta testers in the coming weeks. As you can see, it lets you pick between potential #OhmHour times over the coming week. Heads up: not all #OhmHours can be voted on. You’ll see the widget on your dashboard only when the upcoming week has #OhmHours where voting is possible. What is it? How do I vote for #OhmHours? Cast your vote for when you want your #OhmHour. Make sure to vote before each Saturday at midnight. You won't get the day you selected, unless it's the one with the most votes. To help, we'll always show you which day is currently winning. Heads up: voting for your #OhmHours does not impact if you get a Prize or regular #OhmHour for points.